Scooper - Technology News: Is this the key to successful global trade? Is this the key to successful global trade? So reads a 2016 report by the World Bank titled Connecting to Compete 2016: Trade Logistics in the Global Economy . 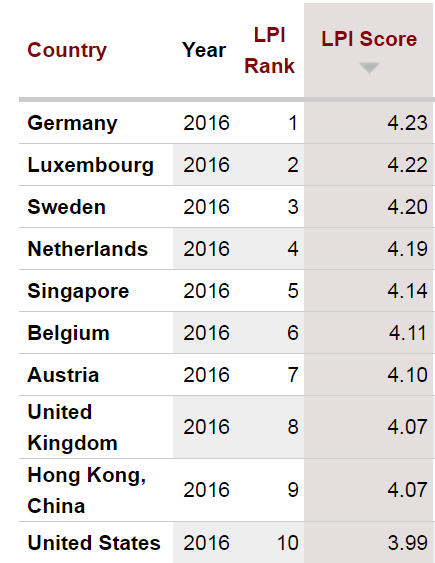 The report features the Logistics Performance Index , which ranks Germany as the world champion in logistics. The country scores even higher than it did the last time it topped the index, two years ago. In today’s interconnected and interdependent global economy, where consumers and citizens benefit from the global flow of goods, we need to collectively ensure that all parts and pillars across the globe can carry the heavy loads coming through the supply chain. Logistics is the key enabler of the world’s supply chains, which bring resources, seeds, fertilizers, materials, parts, machinery and equipment to farms and factories, as well as goods to shops, supermarkets and households. Without logistics, today’s global procurement, manufacturing and distribution would not exist. Logistics connect sellers and buyers across the globe and provide companies with access to domestic and international markets. Related services influence the cost of goods and determine the competitiveness of economies. Their integration in global trade and value chains adds value to the worldwide networks of procurement, production and distribution so important for job creation, national economic development and wealth. In short, when logistics function as they should, they are the basis upon which economies are built. In the top 30 of the Logistics Performance Index we find 22 OECD countries and 14 members of the European Union. China moved from 28 in 2014 to 27 in 2016. India , currently the world’s fastest-growing large economy, did not make its way into the top 30 this time but has jumped 19 places to rank at number 38. Strong nations depend on and benefit from buying and selling in foreign countries. Competition is what drives them, collaboration is what helps a nation to capture its full potential. Globalization, logistics and trade have had a significant impact on global wealth levels. In 2013, the Economist wrote that in 20 years nearly 1 billion people had been taken out of extreme poverty . In 2015, the World Bank announced that global poverty was likely to fall below 10% for the first time. This reflected the entry of China, India and other developing countries into the global procurement, manufacturing and distribution system, as increasingly powerful players in the world economy. Still, many developing countries remain on the margins of world markets, requiring helping hands to improve their logistics capabilities. Between 2007 and 2014 the gap between top and low performers was slowly shrinking – driven by the logistics sector’s continuous improvements in infrastructure and service quality, as well as customs clearance processes. In 2016, logistics performances converge at the top and the gap between high and low performers widens. Logistically constrained countries – landlocked nations without direct access to the oceans and global waterways, for example – are regularly struggling with trade and transport facilitation and reforms. Beyond political will, the disadvantaged countries with weaker logistics (often today’s suppliers and definitely tomorrow’s potential customers) require and deserve attention and support from the international community. In high-performing nations, slower global trade after the 2008 global financial crisis, as well as environmental concerns, create a pressured environment for the logistics industry. The sector – itself estimated to contribute 23% of total global greenhouse gas emissions – faces concerns over jobs, land use and urban planning. In the interests of economic inclusion and peace, all nations need to further advance trade and transportation facilitation, whether individually or collectively, while safeguarding the citizens against harmful activities. According to the World Bank report, “supply chain reliability continues to be a major concern among traders and logistics providers”. And indeed, reliability is more important than speed. And critical for reliability is efficiency at the borders. The current global trend towards disintegration, such as Brexit or the erection of fences at the Hungarian border with Serbia and Croatia, are not helping. In economies where infrastructure and skills are no longer the key concern, governments might need to invest more money and time in explaining to the citizens the benefits of trade and logistics.